Stretching from Cancún to Tulúm, Mexico’s Riviera Maya is one of the world’s premier beach destinations thanks to its white sands, blue Caribbean waters, and warm weather year-round. Plus, thanks to the region’s prosperity and high level of investment from the government and the private sector, the feel is First-World and modern when it comes to infrastructure, services, and amenities. And traditional Mexican culture, from music to food to cultural events, is still very much alive here. Mexico is the most popular expat spot for Americans, with an estimated one million in the country. And the Riviera Maya has quickly become a favored area. There is something for everybody when it comes to a place to live on this coast, whether you want a seaside village, resort-style living, or a sophisticated city atmosphere.The Mexican government decided in the 1970s to make this region on the east coast of the Yucatán Peninsula a focal point of tourism. They subsidized the building of hotels on the island of Cancún, and that kicked off development up and down the coast, quickly turning it into a popular vacation spot for visitors from around the world. Soon after, retirees and other expats discovered the charms of living year-round on the Riviera Maya. Cancún, at the northernmost point of the Riviera, is home to a city of 400,000 on the mainland—the center of government and business in the region, as well as a “hotel zone” chock-full of all-inclusive resorts and shopping malls on a barrier island just offshore. Some expats live here, both in the hotel zone and in the mainland city. 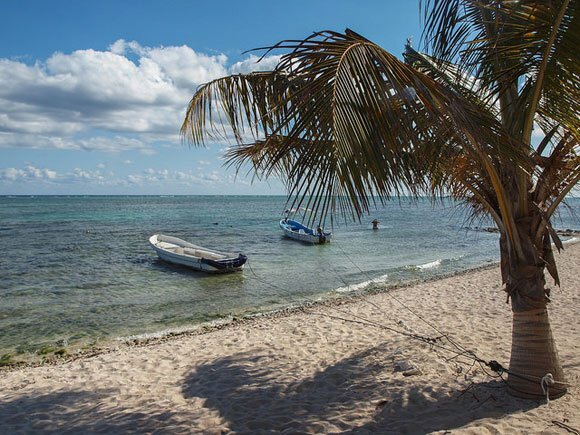 About 20 minutes south is Puerto Morelos, a working fishing village that has become a favorite among expats for its peace and quiet…as well as its beach lifestyle. Playa del Carmen is a rapidly-growing seaside town well-known for its vibrant nightlife, restaurant scene (everything from traditional Mexican to sushi to Italian gourmet favorites), and world-class shopping centered on the pedestrian-only La Avenida Quinta entertainment district. The cosmopolitan group of expats gives it a real international flavor. 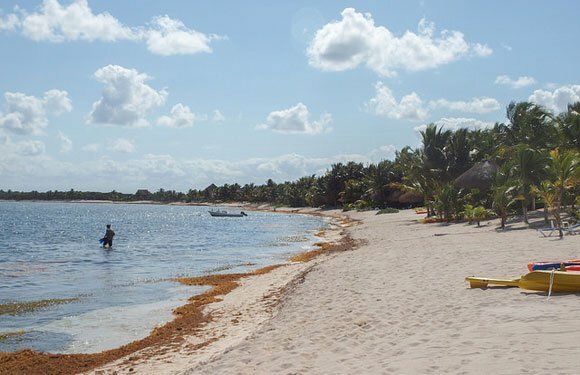 Laidback Tulúm is at the far south of the Riviera Maya. Once a stop on the backpacker’s trail through Central America, the town has “grown up” and become a haven for retirees and other expats seeking all the advantages of the Riviera Maya without the crowds and development of the communities to the north. The feel is still bohemian. Scuba diving and snorkeling, boating, fishing, swimming in freshwater cenotes, exploring the Maya ruins that dot this region…there’s no shortage of things for the active expat to do on the Riviera Maya. And, of course, there are established expat communities you can join very easily and enjoy an active social life of dinner parties, happy hours by the beach, dinners out, and more. Plus, if you’re into volunteering and working in the community there’s plenty of opportunity for that, too. The Riviera Maya, located on the eastern coast of the Yucatán Peninsula, enjoys warm weather year-round thanks to its tropical climate. Temperatures range from highs up to 82 F to lows in the high 60s F in December to February, to highs in the mid and high 90s F in June and July. The cooler temperatures from November to April—thanks to steady ocean breezes—make that the tourist high season. There is a rainy season that brings afternoon showers from May to October, with September and October being the rainiest months. The area is more humid this time of year. Ocean temperatures are pleasant, making for great swimming all year, ranging from the high 70s F to mid 80s F.
Tropical storms and hurricanes can be a concern in this region, as they can be for many coastal areas in the Caribbean; the season runs from June to October. Direct hits from hurricanes occur about every 10 to 12 years, although tropical storms happen more frequently. And even hurricanes that pass by can cause severe conditions. As a result, building codes account for severe weather, and there are emergency plans in place if need be. 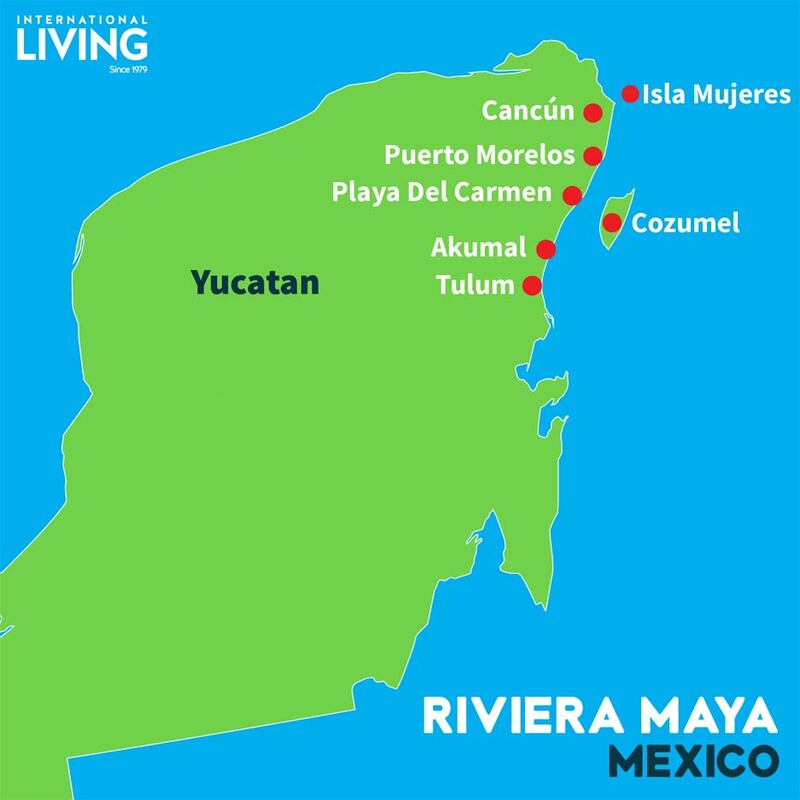 Though not the cheapest area of the country thanks to extensive tourism development, the Riviera Maya still offers an affordable cost of living where you can live well on much less than you’d spend in the U.S.
Also, keep in mind that cost of living is very dependent on lifestyle. If you shop in local markets and don’t make a habit of eating at high-end restaurants, which are plentiful in this region, you can save big time. And be aware that living right on the beach can be pricey to rent and buy…but head inland a few blocks (still only a few minutes’ walk from the water) and you’ll pay much less. The Riviera Maya, encompassing the eastern coast of Mexico’s Yucatán Peninsula from the resort area of Cancún south to the laidback beach town of Tulúm, has a lot to offer expats. World class restaurants…quiet beach bars…live music…fishing…boating…white-sand beaches…and snorkeling and scuba diving in one of the largest and best reef systems in the world. Because it is one of Mexico’s top tourist destinations, the Riviera Maya has received a lot of investment from the government and private investors. And that means plenty of First World services and amenities up and down the coast. Even in such a small area, you have a lot of variety in lifestyle. Cancún is full of resorts but also has condos and other full-time housing—it’s a perfect place for those seeking an “always on vacation” lifestyle. 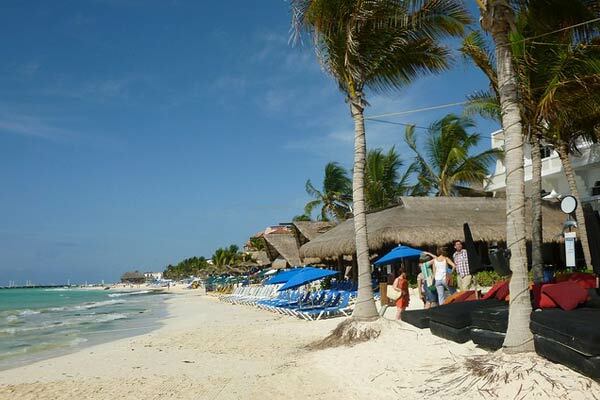 Playa del Carmen a half-hour south is more cosmopolitan and urban and features a lively entertainment district. La Quinta Avenida, or Fifth Avenue, which is a pedestrian only boulevard that runs parallel to the beach and is lined with restaurants, bars, boutiques, shops, and more. Tulúm is more bohemian and low-key—a perfect haven for those looking for a quiet beach escape. It’s about an hour-and-a-half drive from Cancún to Tulúm. 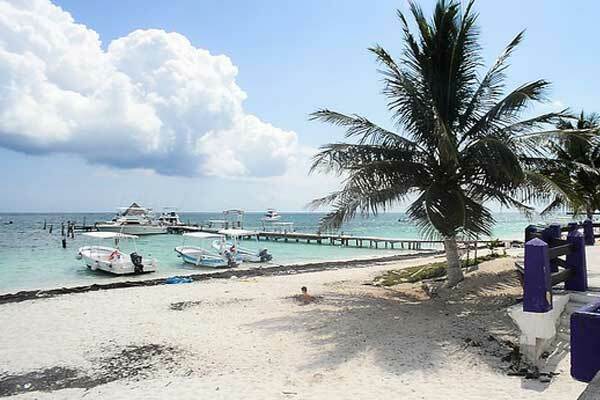 Meanwhile, you have Puerto Morelos, a small fishing village just south of Cancún turned expat haven that is perhaps the closest you get to traditional Mexico in this region. The great weather year-round—it never gets cold—means a lot of time is spent outdoors. It’s always a good time to go to the beach. Watersports, or just relaxing in a comfortable chair on the sand, are popular activities among expats. The region is home to large numbers of retirees and other expats, and it’s an active community. It’s easy to make friends, and there are many opportunities to socialize. That means a lot of parties, dinners out, community groups, happy hours, clubs, sports, church organizations, and more. Expats say there’s never a dull moment on the Riviera Maya. Also, they feel warmly welcomed by their Mexican neighbors. While North Americans make up the bulk of the expat community, including many “snowbirds” who come down during the winter months to escape cold weather back home, there is also significant population of foreign residents from Argentina and other spots in Latin America, as well as Germany, France, Italy, and other European countries. It’s quite an international cast of characters. The fat thumb of the Yucatan Peninsula extends from Mexico’s eastern seaboard into the warm currents of the Gulf of Mexico and the stunning turquoise, tropical waters of the Caribbean Sea. The shimmering, sugar sand beaches of the Riviera Maya stretch for 80 miles along the peninsula´s east coast from Cancun to Tulum, drawing some 5 million tourists each year to its perfect, palm studded beaches. 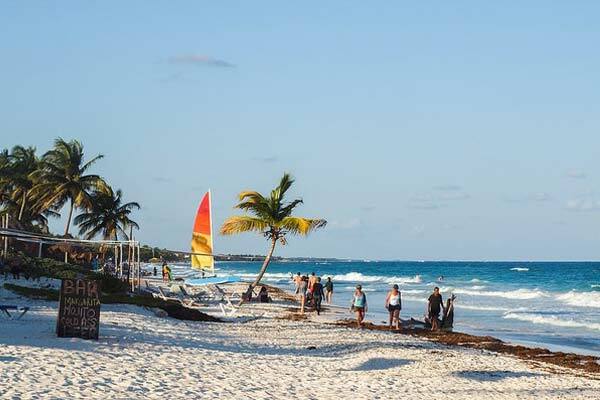 With temperatures typically around 80 F and plenty of sunshine, the Riviera Maya draws, not only tourists to its shores, but has also become home to a significant number of expats who have chosen this stretch of Caribbean paradise as home. A bustling international airport assists Cancun in achieving its reputation, not only as a major vacation destination, but also the gateway for the entire Rivera Maya area. Positioned directly on the shores of the Caribbean Sea, Cancun is well known for its large number of all-inclusive resorts, drawing tourists from across the globe. Those wishing to spend their vacation/resort time seeking a suntan and a hangover, will not be disappointed. However, those who restrict their visit to the confines of a resort, will never taste the true flavor of Mexico. In fact, those expats who live in Cancun often say that while Cancun isn’t really Mexico, you can quickly get to Mexico from there as Cancun connects to all of the Yucatan Peninsula via a modern road system. With a population topping 750,000, Cancun is a unique city in Mexico. It offers the first world conveniences of modern, beautiful shopping centers, glitzy, sprawling resorts, big box stores, modern hospitals, name-brand retailers, and over 750 restaurants, which are contrasted by Maya ruins within the city and a traditional centro area with open markets and small retailers. Cancun was deliberately constructed to serve the needs of pleasure-seeking, international travelers and has been very successful in this endeavor. The tourist area of the city, known as the Hotel Zone, fronts the Caribbean Sea, with sprawling resorts and posh condo complexes claiming this prized real estate. At only four miles long and about a half mile wide, the tiny Caribbean island of Isla Mujeres (eight miles off the coast of Cancun) has a strong number of supporters. With a rocky coast and a strong surf, Mujeres isn´t the typical sandy island retreat most would picture in their dreams, and yet, flocks of snow birds return to Isla Mujeres every winter to escape cold winters north of the border. The island is driven by tourism, as well as a strong winter season. Ferry service runs about every 30 minutes from several terminals in Cancun, shuttling day-trippers for snorkeling and reef excursions. There are ample numbers of restaurants and naturally, seafood is always on every menu. The waters surrounding Isla Mujeres are teeming with sea life and divers, snorkelers and fishers are rarely disappointed. Water recreation is a vital part of life on Isla Mujeres. Almost everything you may need can be found on Isla but for those other things, a quick ferry ride into Cancun can connect you with those things not easily found on the island. Head south from Cancun and about 30 minutes later, you´ll see the turnoff for the lovely beachfront village of Puerto Morelos. And while the central area is very much village-like in its appearance, Puerto Morelos is no longer the sleepy backpacker community it once was. It has been discovered and with that discovery has come some large resorts (tucked out of sight just north of town) as well as some condo developments. 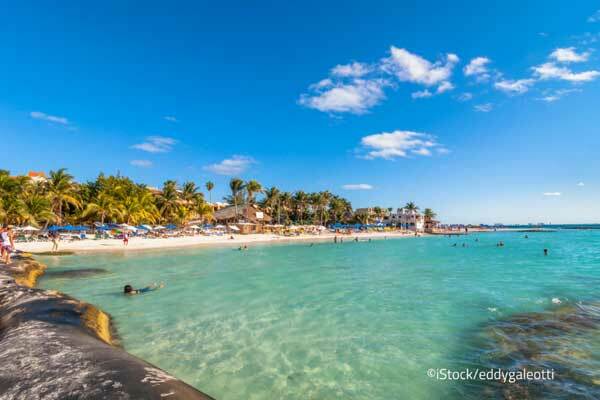 Best known as a popular snowbird escape during the winter months, Puerto Morelos has also nurtured the growth of a sizeable and growing full-time population of expats. A collection of small, colorful fishing and diving boats rests a few yards off the beach and a couple of piers facilitate the loading and unloading of fishers and divers who enjoy the reef only a mile or so offshore. Seafood is the thing in Puerto Morelos and ample offerings can be found all along the street fronting the beach. Most restaurants are accessible from the beach side or the road side and casual attire (think swim wear) is customary. The village supports a number of touristy enterprises such as gift stores and diving/snorkeling tours, a few bed and breakfasts and a small hotel or two. You simply can´t go wrong with any of the seafood dishes in any restaurant. 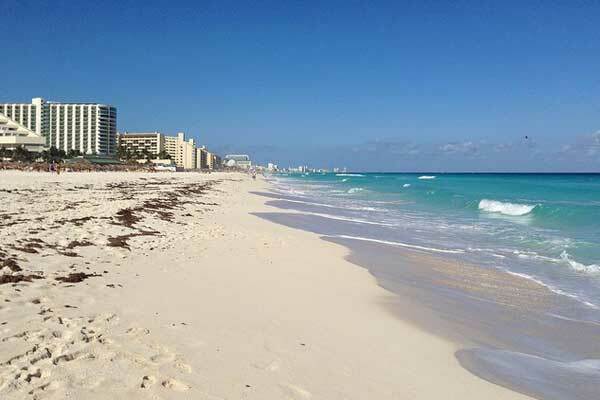 An hour south of Cancun lies the city of Playa del Carmen. Like all the communities along the Riviera Maya, Playa del Carmen or Playa as the locals call it, began life as a small fishing village. The neighboring island of Cozumel, just offshore, generated a need for ferry service to shuttle cruise passengers to the mainland and Playa del Carmen began its growth to cater to the needs of arriving cruise passengers as the ferries provided a non-stop stream of tourists with money to spend. From those beginnings, Playa has emerged as a major expat stronghold. 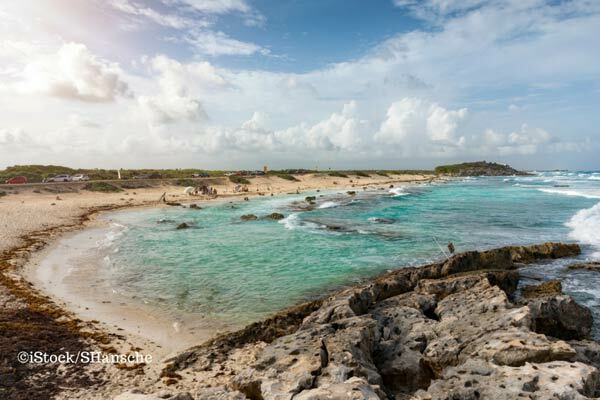 With ready access to the famed beaches as well as quick entry to the island of Cozumel, Playa del Carmen offers travelers and residents, alike, beautiful beaches and a stable infrastructure. Playa´s tourist offerings are a bit less ostentatious than those presented by its northern neighbor, Cancun, while retaining the same Caribbean feel. Perhaps best known for its pedestrian thoroughfare, Quinta Avenida (5th Avenue). This miles-long walkway is filled with hundreds of designer shops, boutique hotels, chic cafes, and dozens of great restaurants. Meandering along 5th Avenue is a great way to spend a warm, tropical evening. With a few modern hospitals, ample doctors, and some nice malls, life in Playa del Carmen is Cancun Light, without the glitz. While technically not part of the Riviera Maya, the island of Cozumel, just offshore of Playa del Carmen, is close enough to count. Cozumel is best known as a cruise ship and world-class diving destination. Serving some 4 million cruise passengers annually along with nearly 650,000 air travelers, Cozumel, much like Cancun, relies on tourism to feed its economy. With a resident population of approximately 110,000, Cozumel is about 30 miles long and 10 miles wide and sits about 12 miles off the coast of Playa del Carmen. Its location in the tropical Caribbean Sea is ideal to provide access to a nearby reef with numerous fishing and diving options available through hundreds of guide services. San Miguel is the island´s largest city and the cruise ship center. This is where the action is. Island life, everywhere, is more expensive than life on the mainland but for those who long for life on an island, Cozumel may fit the bill. For the uninitiated, Tulum can be confusing. First, the popular Maya ruin of Tulum is there, right on the beach, and it’s pretty cool. Next, a few miles away is the town of Tulum and it´s divided into two parts…or maybe three, collectively all known as Tulum. If you missed your hippie phase or maybe want to recreate it, the town of Tulum is where you want to be. The New Age movement, complete with ample massage studios, yoga practitioners, shops selling crystals, spiritual guides, and all that goes with it are concentrated on the south beach road. Here, you´ll also find some vegan restaurants and small shops displaying the latest in yoga wear and uber-long dresses. Bicycles appear to outnumber motorized vehicles, or at least it´s a close contest. Those seeking a Zen lifestyle will find ample company in Tulum. The beach area is a few miles off the main highway and close to the Maya ruin. As all places along the Riviera Maya, developers are leaving their mark in this area as expats and snowbirds have been quick to realize the tranquility of this special environment. 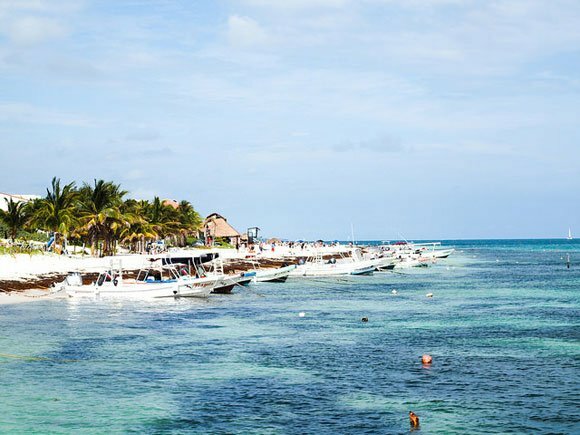 Founded in the late 50s by a handful of divers, Akumal is a tiny village totally tied to the diving and snorkeling occurring in Akumal Bay. This grass-bottom bay is home to a large number of sea turtles which has generated a niche industry, guiding divers and snorkelers in the bay. Unfortunately, without regulation, this bay and it´s hard-shell occupants have both suffered from serious environmental impact. Infrastructure in the community is improving but power and internet, as well as a regulated water supply, have some distance to go before one could say it was stable. The bay is a gorgeous environment, as is the surrounding scrub jungle. This environment, both in the bay and on the land, supports a large variety of birds and small wildlife. 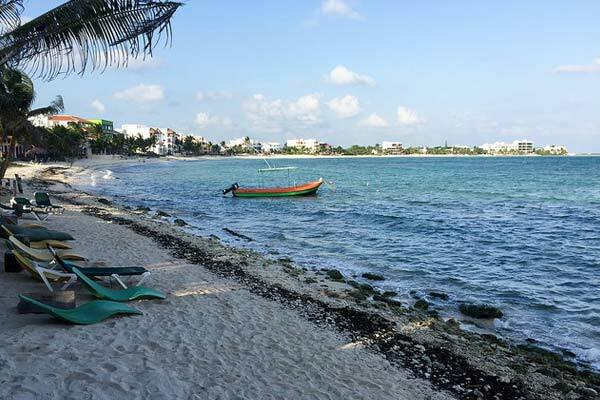 Developers have now discovered Akumal and condos are on the rise. See below for a video of a typical day on the beach in sunny Akumal.